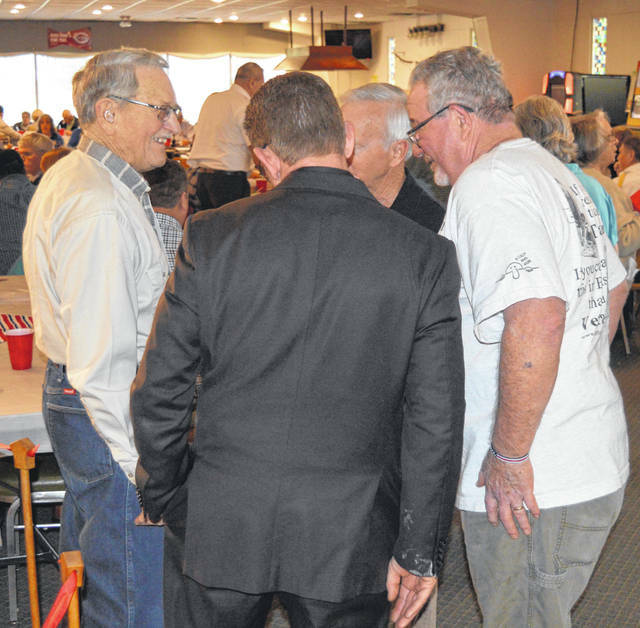 Honor Flight veterans gather including, from left, Randy, Joe and Roger Pinkerton and Paul Pollett. 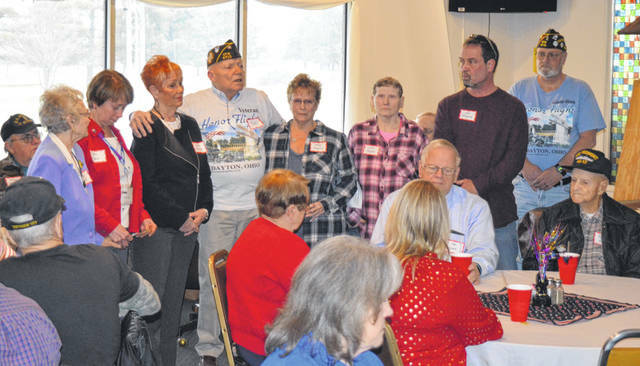 Honor Flight participants who have passed away were recognized and their family members who attended the reunion gathered with veterans Paul Butler, middle, and Richard James, right. Veterans and guests salute the flag presented by the Honor Guard. 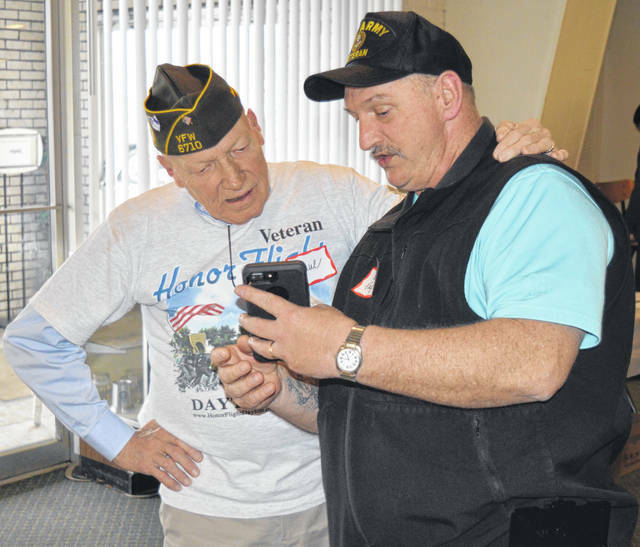 A veteran takes a close look at the photo of the two Clinton County Honor Flights. 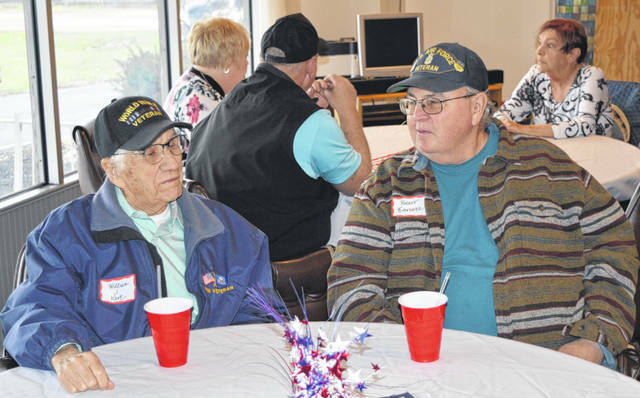 Veterans share some stories at the event. 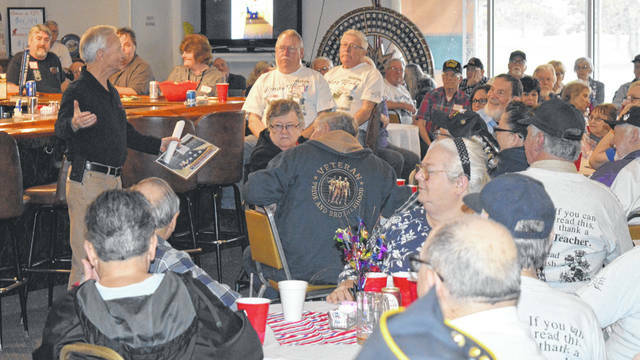 WILMINGTON — Veterans and their families and friends gathered Sunday to reunite and reminisce at the first Clinton County Honor Flight Veterans Reunion. 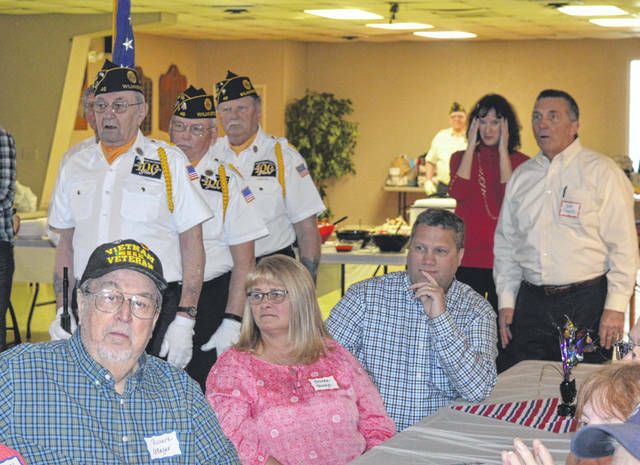 The event, which packed the Elks Lodge on Rombach Avenue, was to honor not only local veterans who participated in the two Clinton County Honor Flights in 2016 and 2017, but any veterans who participated in any past Honor Flight. 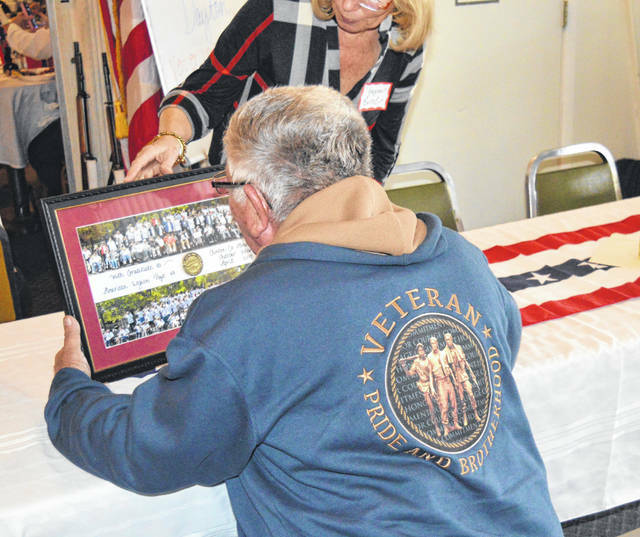 Several veterans who were on one of those Honor Flights have passed away since; their memories were honored at the event and their next of kin and guests were also invited to attend. 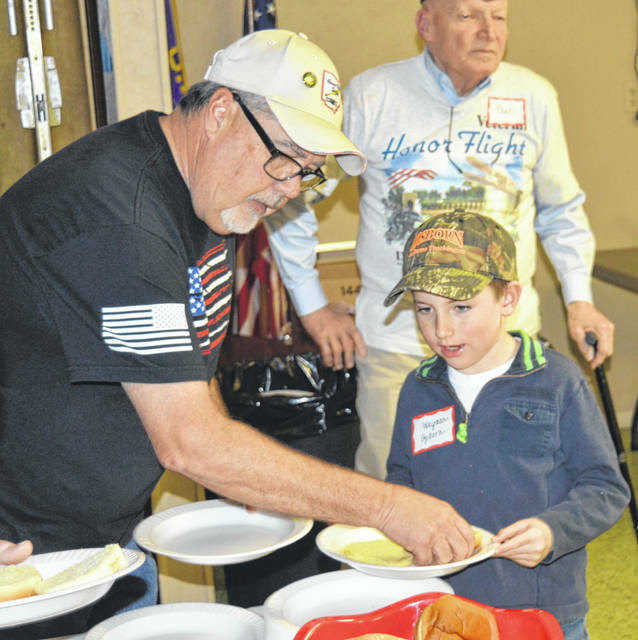 A combined total of 135 local veterans and many volunteers were part of the two Clinton County Honor Flights, the first in September 2016 and the second in April 2017. 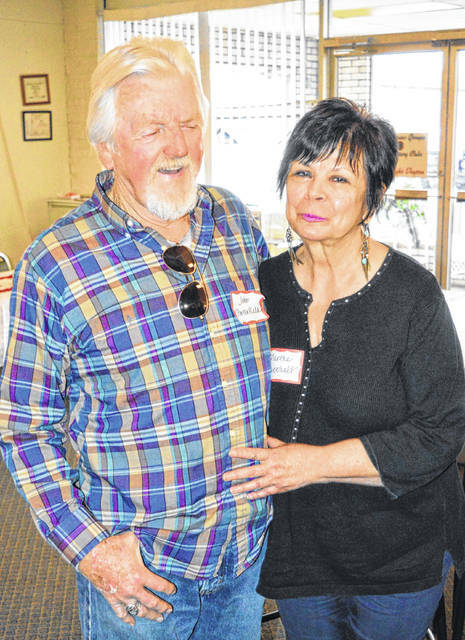 Attendees Sunday included Wayne Fulton and Roger Foster, both 1961 graduates of Wilmington High School. 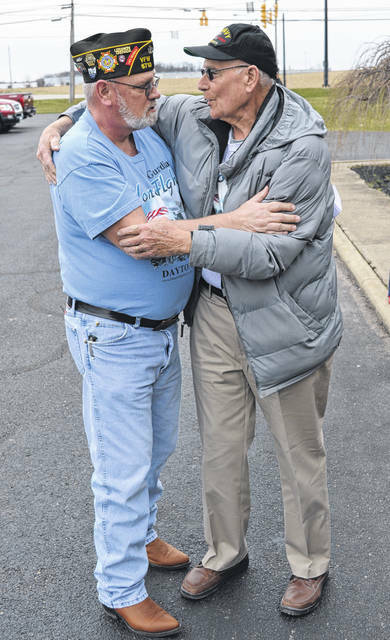 James Caplinger of Blanchester, who served in Vietnam, said in Washington, D.C. he got to “reunite” with some of his buddies — whose names are memorialized on the Vietnam Veterans Memorial Wall. 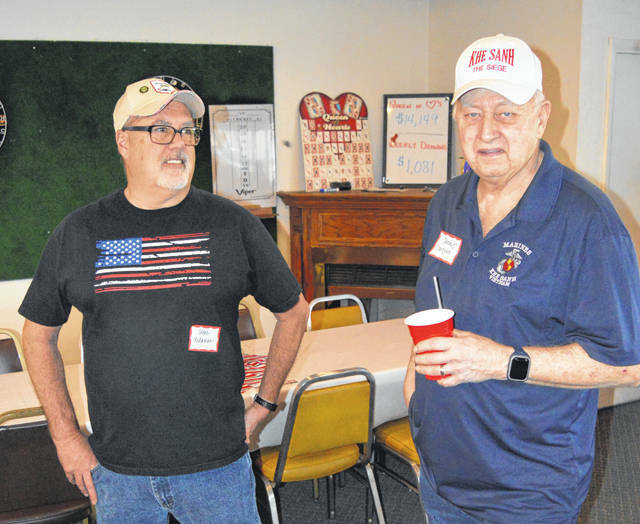 His brothers Joe Pinkerton of Seaman and Roger Pinkerton of New Vienna said the children who came up to them in Washington, D.C. made the experience even more special. 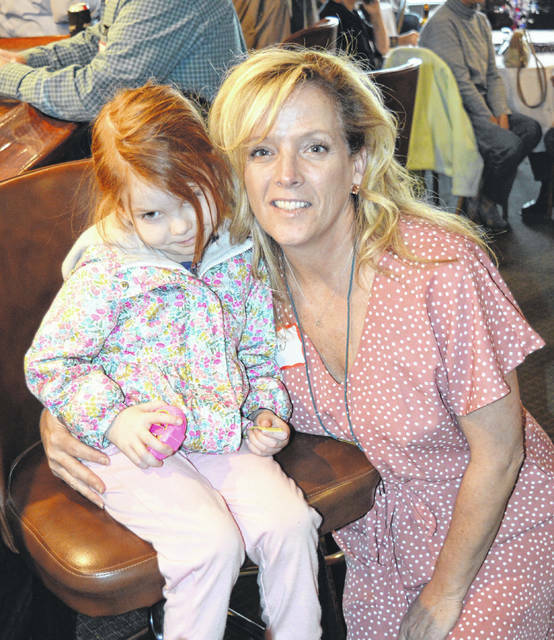 “One little girl wouldn’t let loose of my hand,” said Joe. They said the many letters they received both from both local children and from across the country also touched their hearts. Paul Pollett of Blanchester said he had received 47 letters from kids. “You can’t read them all at once; your eyes will tear up,” he said. 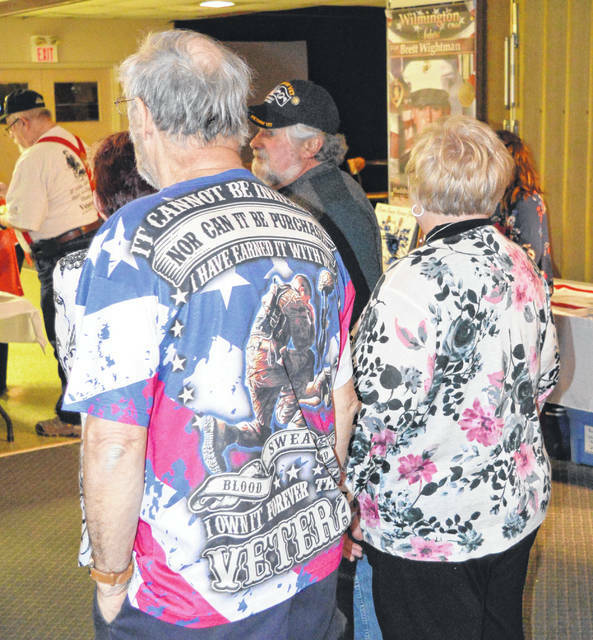 Randy Pinkerton added a comment aimed at any veteran who is contemplating taking an Honor Flight. If you get a chance to go .. go!” he said. 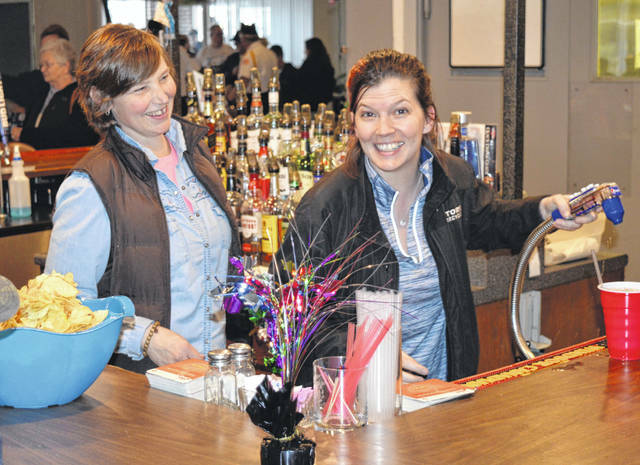 Local residents veteran Paul Butler and Jen Woodland were among those organizing the event. 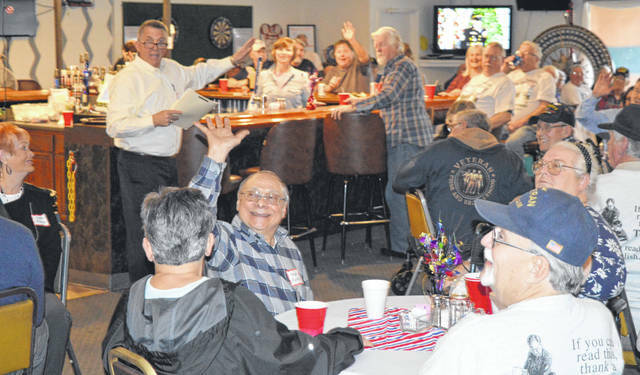 “For the men and women who served in the uniform of our country during World War II, Korea or Vietnam, an ‘Honor Flight’ is a chance to share common experiences and memories, create new memories and, most of all, enjoy the camaraderie of their fellow veterans,” Butler wrote recently. 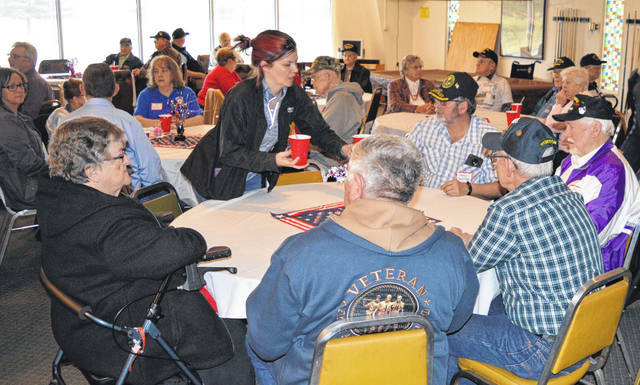 Organizing and fundraising for the two Clinton County Honor Flights was a labor of love for the many veterans, volunteers and businesses and organizations that raised so much money that Clinton County was able to do two Honor Flights. 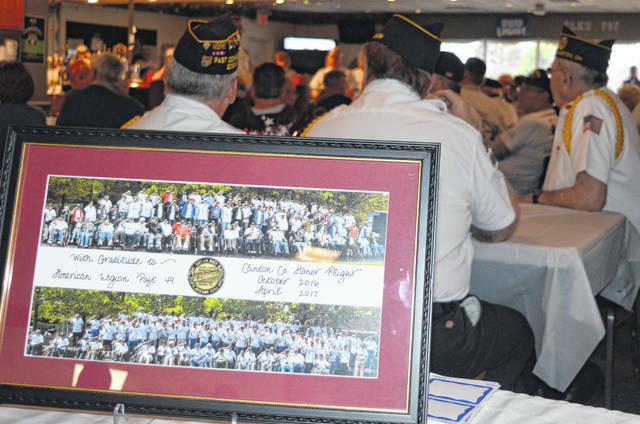 In May 2016, the Wilmington Rotary Clubs, in cooperation with the Clinton County American Legion and VFW Posts, announced that they would try to raise funds for one Honor Flight. 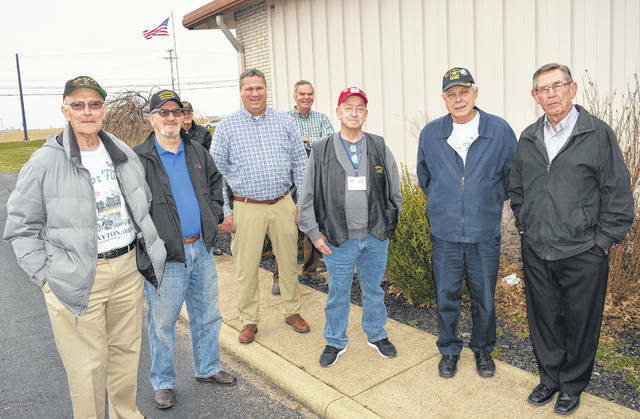 Honor Flights provide a means for veterans of World War II, the Korean War and the Vietnam War to travel to Washington, D.C. to visit the memorials for their wars, among other sightseeing opportunities. 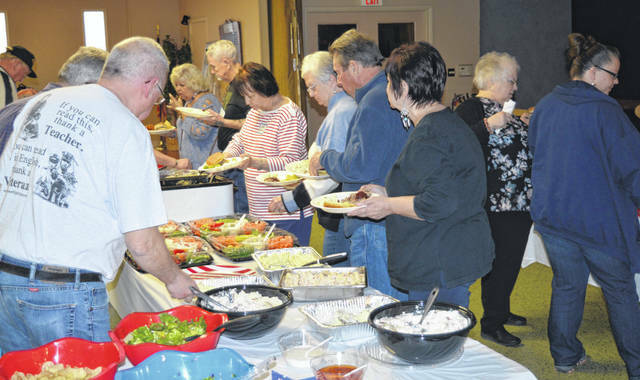 There are also send-off and welcome-home receptions to acknowledge and honor the veterans’ service to our country. 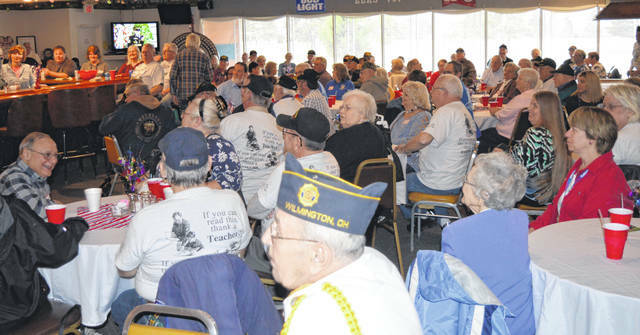 These trips are cost-free for the veterans, so sponsorships and donations are a crucial component to Honor Flights. 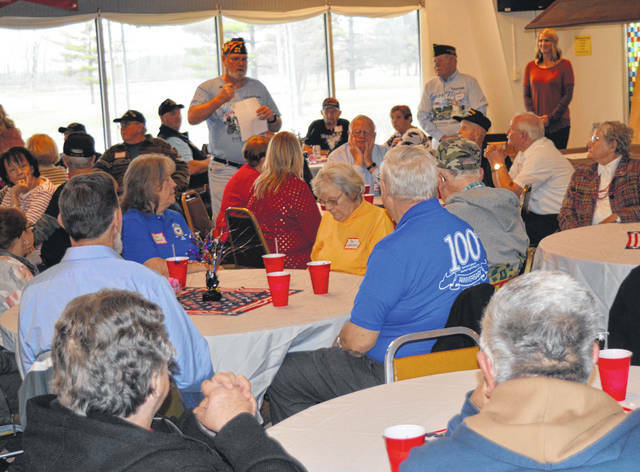 It was Rotary’s intent to raise enough money to fill the plane with 75-90 Clinton County veterans. 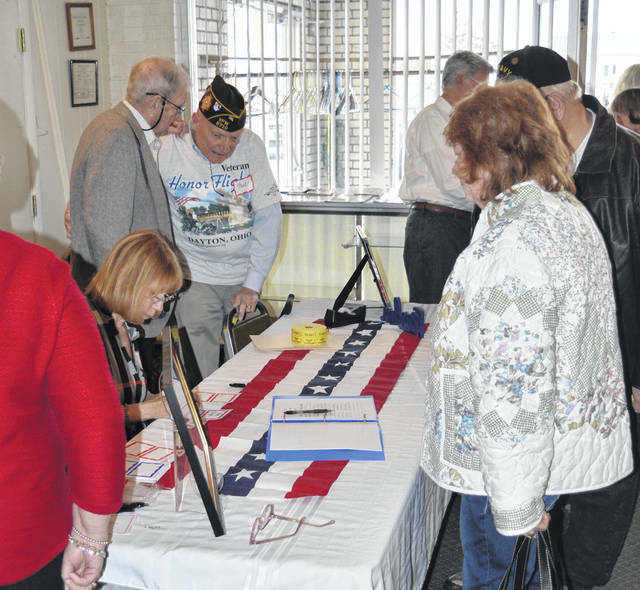 Honor Flight Committee members spearheading the efforts were Paul Butler, Fred Ertel, Randy Graf, Terry Habermehl, Patti Herron, Beth Huber, Richard James, Kathryn Markins, Mac McKibben, Jack Powell, Bob Schaad, Ray Souder, Joni Streber and Jen Woodland. 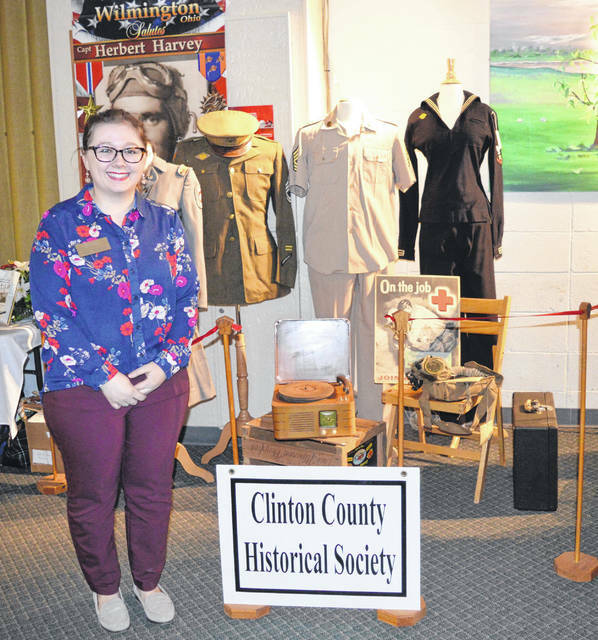 There was even a Clinton County Honor Flight tent at the 2016 Banana Split Festival. And thanks to a generous donation from Ohio American Legion Charities and Wilmington Veterans Post 49, the Honor Flight participants boarded chartered buses at the conclusion of the send-off program for a comfortable ride to a hotel near the Dayton International Airport, where they could get a short night’s rest before departing for their early morning flight to Washington, D.C.
“The committee’s goal is to make this a memorable send-off for this very special group of men and women,” Paul Butler said in 2016. 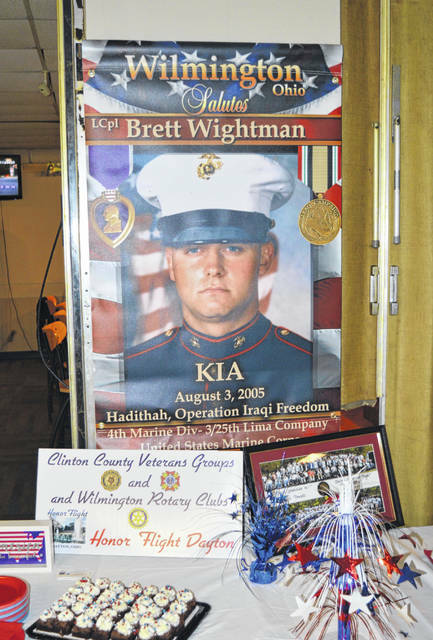 The News Journal also published two special sections prior to the Honor Flights, including bios of all the veterans. 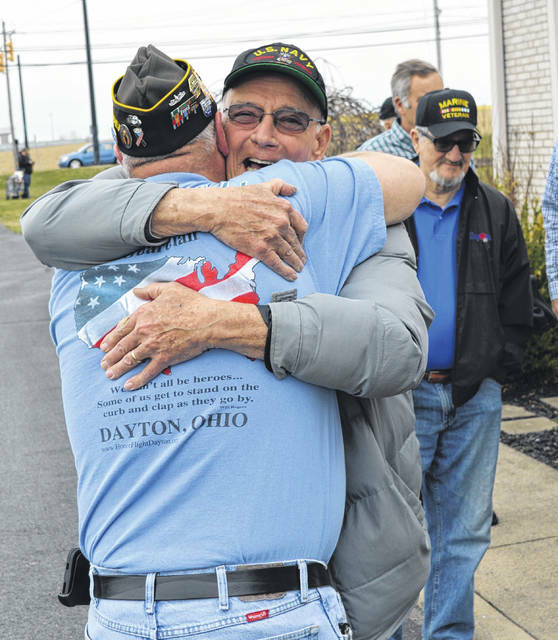 Veterans share a hug as they enter the Honor Flight Reunion.